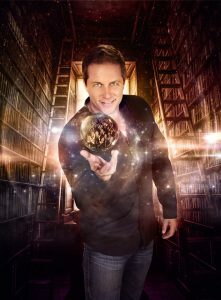 The winner of NBC’s hit TV show “Phenomenon,” a top finalist on “America’s Got Talent,” and a performer on the season premier episode of Penn & Teller “Fool Us,” will perform at the Bicknell Family Center for the Arts on Wednesday, March 14, at 7:30 p.m.
Mike Super is the only magician in history to win a live magic competition on primetime U.S. network television. Super has performed for an array of celebrities, including Ellen DeGeneres, Jay Leno, Criss Angel, Regis Philbin, Joan Rivers, Gary Shanling, and Robin Leach. Tickets are $23 to $25, with discounts for PSU students, faculty, and staff. Tickets may be purchased at the PSU Ticket Office between 8 a.m. and 4 p.m., online at www.pittstate.edu/office/tickets/ or by calling 620-235-4796. Tickets purchased using a PSU ID must be purchased in person.